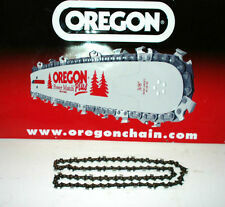 Oregon Chainsaw Chain for Florabest FHE710A1. FLORABEST FHE710A1 & 550 b2. Genuine Oregon Saw Chain. for use with 10" Bar. Full Range of Chainsaws, Chains, Guide Bars. For 16" Guide Bar - Oregon Part No. 91P057X & 91PJ057X. 57 Drive Link x 3/8" Low Profile Pitch, 0.050" (1.3mm) Gauge, Chamfer Chisel. Saw Doctor - DS Bennett. For 8" Guide Bar - Oregon Part No. 91P033E, 91P033X & 91PJ033X. 33 Drive Link x 3/8" Low Profile Pitch, 0.050" (1.3mm) Gauge, Chamfer Chisel. Saw Doctor - DS Bennett. This chain is 3/8 low profile. 043 gauge and 46 drive links. This will fit. 043 gauge bars that have 46 drive link count. This is the new Low-kick chain that replaces 90SG046G. 90PX - series feature low vibration chamfer chisel cutters with twin cutting corners for excellent performance and edge holding durability.This narrow. 043 gauge chain -matched with a micro-lite bar is 15% lighter. 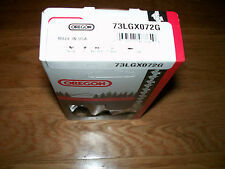 Bosch AKE40-19PRO Chainsaw 16"/40cm OREGON Chain 57 Links 91p the best! New Oregon 57 drive links 91p Oregon chain. Bosch AKE40-19PRO and lots of others. To work out your size remove chain & count the little links SEE PICTURE TWO. professionalsemi chisel chain. FITS B & Qperformance power pro pcs2200 & lots others ch eck your drive links. To work out your size remove chain & count the little links which fit into the guide bar see pic two! These chains are the new LGX pro series with the blued cutters for improved strength-very fast cutting-and what all the loggers use in this area.They are not safety chain.They are full Chisel cutters made from OCS-01 steel provides greater durability especially in cold cutting conditions. 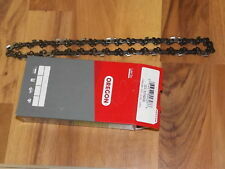 OREGON 20" chainsaw chain 76 DRIVE LINKS .325" pitch 058" FITS CHINESE SAWS! FITS MANY CHAINSAWS INC LOTS OF CHINESE MODELS. To work out your size remove chain & count the little links which fit into the guide bar. Oregon Grinding Stones for use in the Oregon Electric Sure Sharp Chainsaw Sharpener. Husqvarna, Oregon, Makita, Danarm, Silky Saws, Arbortec, Lavoro. At Willis and Grabham we specialise in Chainsaws, Garden Machinery, Tools & Accessories and are committed to providing you with quality genuine products at very competitive prices. Fits 196742-3. Fits most Makita battery and electric with 16" bars. This fits any. 043 gauge or 1.1 mm 16" bar used on newer saws. Chain will have 90 printed on drive link. This is the Oregon's newest Low-kick chain (90PX series feature low vibration chamfer chisel cutters with twin cutting corners for excellent performance and edge holding durability.This narrow. 043 gauge chain -matched with a micro-lite bar is 15% lighter. ). Replaces the following part numbers: Champion- CY7Y, Bosch- WS8F, NGK- BPM7A, Nippondenso- W22MP-U, Autolite- 2974, AC-CS42S. Alpina, Castor, Dynamark, Husqvarna, Jonsereds, Lombard, Olympyk, Solo - saws, Champion- RCJ6Y, Bosch- WSR5F, NGK- BPMR7A, Nippondenso- W22MP-U, Resistor plug - Tecumseh TC300, Stihl Chainsaws. FOR A 50:1 FUEL:OIL RATIO, MIX 100ML OF OREGON 2 STROKE OIL WITH 5 LITRES OF PETROL. COMPATIBLE WITH ALL OTHER 2 STROKE OILS. To work out your size remove chain & count the little links which fit into the guide bar. Professional chain. Here is 1 dozen 13/64" (5mm) swiss made oregon files. Part number 70505 this is the desired size when using file guides-carlton etc. Pictures are of actual item. Florabest FKS2200 &FLORABEST FKS 2200 G4. 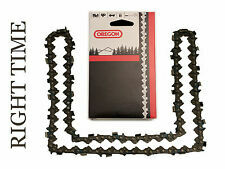 New oreogon 57 drive links 91p 0regon chain. To work out your size remove chain & count the little links SEE PICTURE TWO. proffessional semi chisel chain. OREGON Chainsaw Chain Sharpening Kit. Kit Contains At Willis and Grabham we specialise in Chainsaws, Garden Machinery, Tools & Accessories and are committed to providing you with quality genuine products at very competitive prices. FITS Ryobi Expand It Pruner Range. To work out your size remove chain & count the little links which fit into the guide bar. 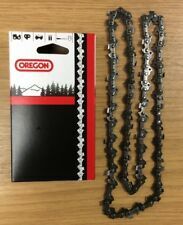 15" oregon chain fits husqvarna 136 137 435 445 chainsaws 64 x .325 050 best! To work out your size remove chain & count the little links which fit into the guide bar. TOUGH - POWERSHARP CHAN IS AS DURABLE AND HARDWORKING AS OTHER OREGON 3/8" PITCH, LOW PROFILE CHAIN. ONLY TO BE USED IN CONJUNCTION WITH OREGON POWERSHARP SYSTEM BAR & SHARPENING MOUNT AS NOT SUITABLE FOR ANY NON-POWERSHARP BARS AS THESE ARE NOT STANDARD CHAINS AND CANNOT BE SHARPENEDWITHOUT THE CORRECT BAR AND SHARPENING MOUNT. Fits Husqvarna 236 135 240e. To work out your size remove chain & count the little links which fit into the guide bar. MFG # : 26365. "OREGON" CHAIN SAW GREASE GUN. Universal & can refill. Pre-loaded see through gun. Prolongs life of bar & chain, improves cutting performance. Oregon Square Ground Pro full chisel chain. Sharpens with 3-Corner Chisel File orequivalent.Also sharpened with square grinding wheel on chain grinders. Blued Full Chisel Square ground cutters provide superior corrosion resistance and improved strength. FITS BLACK AND DECKER. 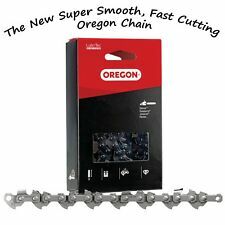 professional semi chisel chain Oregon chain. To work out your size remove chain & count the little links which fit into the guide bar. (AND OF OTHERS). To work out your size remove chain & count the little links which fit into the guide bar. proffessional semi chisel chain. 20" oregon chain 78 x.325 058" husqvarna chinese & PRO AM BARS & many fitments! This chain is the new LPX pro series with the blued cutters for improved strength-very fast cutting-and what all the loggers use in this area.This is the Professional series -not safety chain.This is has full Chisel cutters made from OCS-01 steel provides greater durability especially in cold cutting conditions.The top of the tooth have the file marks stamped on them- no more guessing at the angle. This chain is 3/8 low profile. 043 gauge and 34 drive links. (90) on drive link. New narrow kerf design. 90PX - series feature low vibration chamfer chisel cutters with twin cutting corners for excellent performance and edge holding durability. Brand New Genuine Oregon Power Mate Rim Sprocket System… · Oregon Part # 34162X · Fits Stihl 029, 034, 034 SUPER, 036, 036 PRO, 039, MS 290, MS 310, MS 311, MS 360, MS 360 C, MS 360 Pro, MS 360 QS, MS 390, MS 391 Models Using This Size Sprocket · Crank Diameter: 0. New Oregon 14" 52 x drive links Ripping chain. professionalsemi chisel Ripping chain. Designed for fast cutting and prolonged professional use for ripping back timber. Fits Husqvarna 236 135 240e. It replaces 91VG033G and is safer. Box color varies. Oregons Best low-kickback chain. Here is 1 Oregon grease gun-prefilled with grease with needle tip for sprocket nose bars. Grease gun is made in Germany. Pictures are of the actual item and can describe this item better than words. Fits Makta duc 254z chainsaw. To work out your size remove chain & count the little links which fit into the guide bar. professional semi chisel chain. *never used but has some tarnishing marks* Oregon 38470X type D Power Mate. All the parts shown are what's included. Never used but does have some tarnishing stains as shown in the photos.The cardboxes these parts are in have some marks and stains from age. Shipping is free in the US. This is a lightweight transparent combi can which holds 5 litres of fuel and 3 litres of oil. Husqvarna, Oregon, Makita, Danarm, Silky Saws, Arbortec, Lavoro. Chain pitch across rivets. pocket size tool for quick and easy chain identification. bar groove width with corner tabs. OREGON 68209X rim sprocket system. OREGON rim sprocket system. This sprocket system consists of two components: Clutch cup with splined hub, and a free-floating rim. Rim-type sprocket systems are favored by those who want the ultimate in performance and durability. 91R052G Ripping chain. This chain is 3/8 low profile. 050 gauge and 52 drive links. Fits standard 14" Echo and Poulan chainsaw with 1.3mm bar 52DL. Skip chains are better on long bars.This chain fits echo saws and other saws equipped with a 24" bar. 050 gauge with 3/8 pitch and 81 drive links. 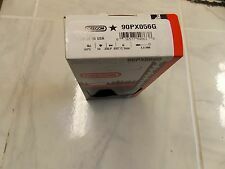 Part number is 72APX081G. Always do a drive link count to make sure this chain fits. Fit's STIHL. NEW 24"OREGON RIPPING SAW CHAIN. To work out your size remove chain & count the little links which fit into the guide bar. 290 310 390 340 360 390 440 460 640 660 ETC. Also fits Stihl 3003 003 4321 bar. Part number is 20LPX080G. This chain is the new LPX pro series with the blued cutters for improved strength-very fast cutting-and what all the loggers use in this area.This is not safety chain.This is full Chisel cutters made from OCS-01 steel provides greater durability especially in cold cutting conditions.The top of the tooth have the file marks stamped on them- no more guessing at the angle. Oregon Type 73 LPX chain, 76 Drive Links Super 70 Chisel chain 3/8" 1.5mm 0.58"
FITS MAKITA 340, 341, 390, 400, 401, 5012, 5014, 5016, DCS330, DCS340, UC3500, UC3501, UC4001A, UC4020A. To work out your size remove chain & count the little links which fit into the guide bar ,see pic two. 91VXL039 that replaces 91VXL039X. This chain is 3/8 low profile. 050 and 39 drive links. This is Pro chain (We have Low-kick 91PXL039G also)Top cutter plates are 33% longer than standard 91 cutters. This chain is 3/8 low profile. 050 and 60 drive links. This is Pro chain (We have Low-kick 91PX060G also) Top cutter plates are 33% longer than standard 91 cutters. Semi chisel cutters provide an aggressive cutting edge with a forgiving sharpening profile and good stay/sharp. Fits small Stihl 029, 034, 036, 039, MS290, May fit others, Don't quote us on that. Convert your junk Paddle wheel to a Small Rim Sprocket. Oregon part number 34162 Rim style clutch drum with. No sprocket , small 7 Spline. Oregon Chainsaw Filing Vise 26368A. Vise's forks drive into any stump or log. Vise's jaw locks the bar securely. Ideal to be used in the field for professional users, this filing vise makes chain maintenance easier. 91R056G Ripping chain. This chain is 3/8 low profile. 050 gauge and 56 drive links. Fits standard 16"Husqvarna ,poulan or sears chainsaw with 1.3mm bar 56DL.